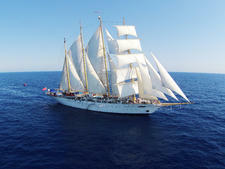 Royal Clipper is an ideal ship for people who aren't big on cruising, but adore sailing. Billed as the world's largest full-rigged sailing ship (it's got a Guinness World Records certificate to prove it), this five-masted beauty is a throwback to another era. 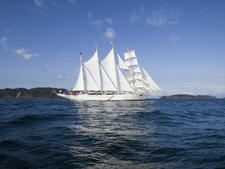 Built in 2000, it's modeled on the Preussen, the largest and fastest deepwater sailing ship of its day. The freight-carrier set sail in 1902, but suffered an early demise eight years later, after a collision with a steamship left it broken on the cliffs of Dover. 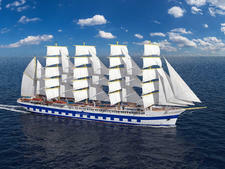 No sailing ship of those dimensions was ever again constructed until Star Clippers owner Mikael Krafft commissioned it as the third ship in his fleet, joining the Star Flyer (1991) and Star Clipper (1992). In an industry racing for the next onboard gimmick -- from robot bartenders to ice skating rinks -- Royal Clipper simply races across the sea. This 442-foot ship is proudly lacking in bells and whistles. But you don't have to know the difference between a flying-jib and a topmast staysail to appreciate its majesty. Standout experiences await, from lounging in the bowsprit net suspended high above a roiling sea, to kayaking and stand-up paddleboarding off the marina platform at the rear of the ship. Come time to sail away, the hoisting of the sails is cause for ceremony. The action is accompanied by the epic strains of Vangelis' "Conquest of Paradise" from the movie "1492." Passengers never tire of the sight, streaming out onto the expansive deck to watch the action whenever it occurs. If you need glitzy production numbers, bingo tournaments and multiple restaurant options to be happy at sea, seek out a bigger ship. If the notion of feeling the gentle rock-a-bye motion of the ocean is in itself enough to lure you to sea, this is the ship for you. Passengers are primarily a mix of North Americans and Europeans (mainly German, French and British as evidenced by the triple translation on most written materials). There was a wide age range -- from 30-year-old honeymooners to longtime retirees -- on our cruise. The demographic generally skews 50s and above, and many are current or former sailors with a real appreciation for sailing ships. The vessel also attracts a good number of repeat cruisers. On this cruise, more than a few were taking back-to-back sailings. One particularly ardent fan was on his seventh back-to-back cruise on the Royal Clipper in as many years. This is an adult vessel; there are no diversions designed for children, and teens would need to make their own fun. As for grownups, if you require 24/7 programming and standard big-ship amenities like a casino and theater, you'd be happier on a more conventional cruise. And take note that because there are no elevators on this four-deck ship, it's not a great fit for those with significant mobility issues. Attire is shorts-and-T-shirts casual by day. Evenings are casual, as well -- there's no need to pack formalwear. But swimsuits, shorts and flip-flops aren't welcome in the dining room. Men are expected to wear pants (as opposed to shorts) to dinner; women wear slacks or casual dresses. Bathing suits should be worn only on deck. The onboard currency is the euro. The line suggests 8 euros a day per person for gratuities, which can be added to your shipboard account. Or, if you prefer to tip in cash, an envelope is provided to place in the Crew Tips Box. A service charge is incorporated into bar tabs.